Go to your designated poll site, sign in, and get your paper ballot and voter card from the poll worker. 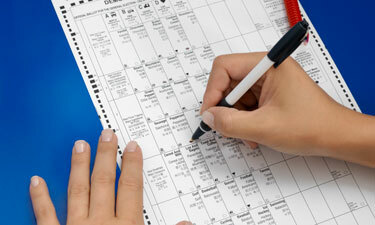 A privacy sleeve will be provided to shield your ballot from view after you have marked it. Do NOT use an “X” or a "√", circle the oval, or make stray marks on the ballot. Do NOT fold your ballot. Take your ballot and voter card to the scanner area. To change a selection, select the contest or issue you would like to change and reselect the proper choice. Select "NEXT" to return to the summary screen. Select "Mark Ballot" to print your marked ballot.